Are you tired of Winter yet? So how has the weather been where you are? Here it has been crazy especially this week! Just yesterday we went from a high of 42 degrees to a low of -5. (Yes in Fahrenheit.) We have two more days of warm weather coming and then we are getting back to our “seasonal” temps averaging in the 20’s. Brrrr!! But as much as I sometimes hate winter, I love how my children’s jackets pop against the snow as I watch them enjoy playing. It makes me wish I had warm enough gear to go out and play with them too! But little Fiona is too small yet to go out so I hang out with her and enjoy their antics from inside the house. 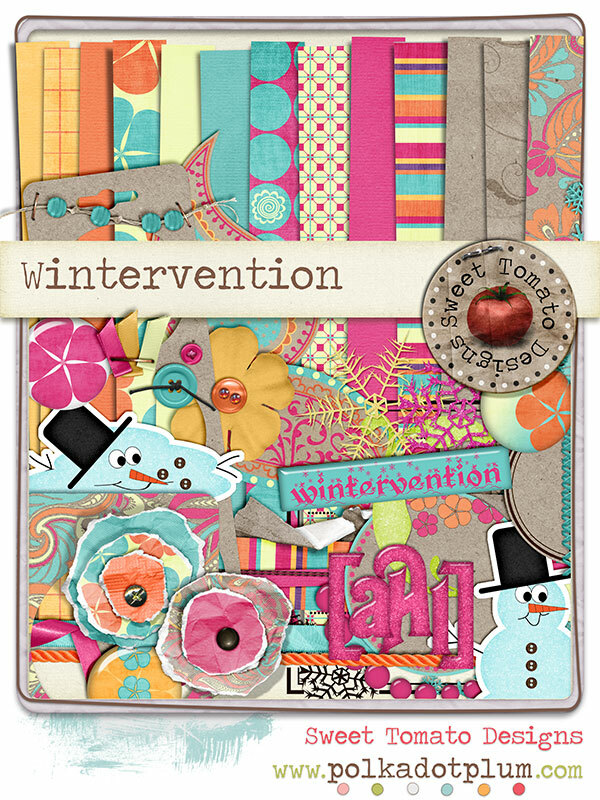 It’s kits like Sweet Tomato Designs newest, Wintervention, that just scream to be downloaded and used for those winter photos. Just like the kids jackets pop on that snow, all of your pictures of the kiddos in their snow gear surrounded by all that white will pop against these beautiful colors. You can get Wintervention at either Polka Dot Plum or Scrappity-Doo-Dah. Now I did have to play a little with this kit 🙂 And in the end created a custom background paper by combining two of them in order to make my frame cluster stand out a bit more, yet give me that background interest that I really wanted. 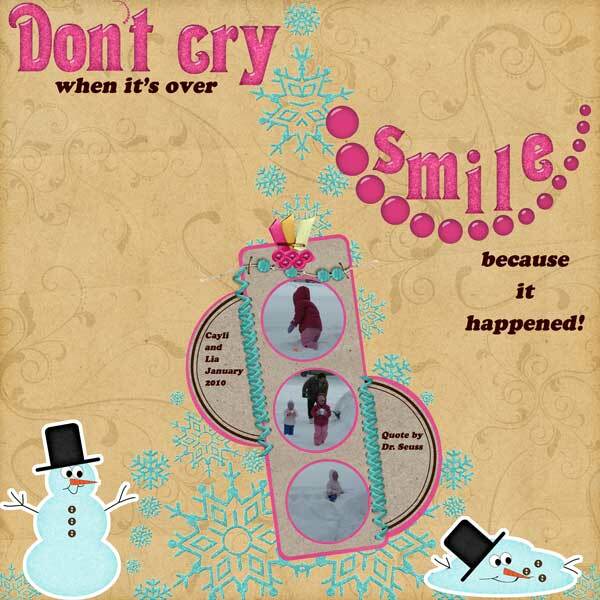 That is the beautiful thing about digital scrapbooking! This winter has been hard for me to get the girls out to play as it is a production usually taking up to 30 minutes to get them ready and Miss Joy is not always wanting to be patient that long. But they still get out, still try to roll a snowman. And although daddy is glad he doesn’t have to shovel each weekend when he gets home (yeah, we bit the bullet and got a plowing contract for the rest of the season) I know he misses the opprotunity to be out there playing with them when I’ve sent him pictures.